This New Approach teaching video is about musicians' injuries, for violin and viola players, how to prevent and eliminate them. Have you ever suffered from serious nerves that prevented you from playing for any sort of audience, as well as you can do when you play on your own? Have you ever suffered from any aches and pains in your shoulder, neck, forearms, thumbs, or even serious tendonitis or tendinitis, tenosynovitis, fibrositis, bursitis, carpal tunnel syndrome, etc.? Have you ever heard (I did) of anyone who had to undergo surgery because of physical injuries caused by playing an instrument? I personally know more than one who then gave up playing altogether, despite surgery. All these things are interrelated. Maybe you've been told that there is nothing you can do about it, that it's "part of the game", but this is not true, it doesn't have to be so. There is no point in having rests when practicing, massages, undergoing surgery, taking painkillers to be able to keep playing despite the pain (as some do, the worst thing to do). If you don't address the cause (incorrect use of the body when playing) of the problem, you'll have the same effect (physical injury). Kato Havas is a violin and viola teacher who, several years ago, was the first one to talk about how to prevent and eliminate physical injuries in violin and viola playing and has been teaching this for about fifty years. Kato Havas was a child prodigy on the violin and received the traditional Hungarian virtuoso training at the Royal Academy of Music in Budapest. Later she developed the "New Approach", a way to teach and play to prevent and eliminate physical injuries. By teaching it, she realised that it also eliminates nerves, stage fright, related to string playing. This approach was illustrated in her book "A New approach to violin playing", published in 1961. Then she also published other books and this teaching video which is of great help to understand everything better. 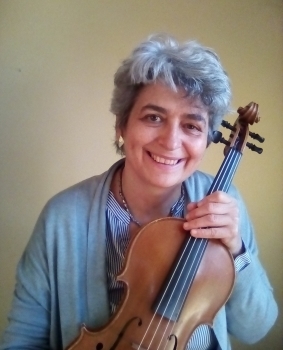 Kato Havas received the “Isaac Stern International Award” from the American String Teachers’ Association for “unparalleled results”, her books were praised by Yehudi Menuhin and she was appointed OBE by Queen Elizabeth II for "services to music". "Miss Havas is original in her approach to the violin [& viola] playing because she insists that technique must be reducible to basic motions involving more than the fingertips"
Kato Havas developed the "New Approach", a way to teach and play to prevent and eliminate physical injuries (tendonitis, tenosynovitis, bursitis, carpal tunnel syndrome, etc.) and nerves, performance anxiety, stage fright, related to string playing. This issue of musicians' injuries is a lot talked about nowadays, not so when Kato Havas books were published in the 1960s. What is different in Kato Havas's teaching, compared to other books and studies published more and more often, in recent times, is not only that she was the first one to become aware of this problem about fifty years ago, but also that she teaches how to prevent and eliminates physical injuries from a musician's point of view. Every movement is done not just because it's good for the body, but it has a musical reason, every movement is in the service of music. This is illustrated in her books "A new approach to violin playing", "The twelve lesson course" and "Stage fright". Despite the title, the new approach applies to all string playing. If you've read her books, you'll find this video great because you can actually see what's written in the books and it will help you to understand it better. "We all have the same aspiration, that of being able to release the full force of our inherent energy impulses into a powerful musical flow. ... The magic of music is in its transiency... Why is this aspiration, so often, so elusive? What are the causes for all these aches and pains and mental anxieties?" This DVD is for practical use, don't just sit there watching it, stop it and do what it says. When Kato Havas published her books, she was well ahead of her time, nobody spoke about physical injuries caused by playing an instrument. Nowadays everybody is well aware of this issue, there are even clinics for musicians' injuries.